The Noodlehead Campfire Messenger is the last bag I completed for the Bag of the Month Club. I've had the Petal and Plume by Bari J from Art Gallery for a while and as soon as I saw this pattern, I knew the flap would be the perfect way to showcase this gorgeous fabric. I coordinated the Peacock Waltz with Rumpled Gentian and some lovely solids from Stay Home Fabrics for the lining and accents. This bag is loaded with pockets! With pleated outer pockets on the front, another front pocket (zippered) and a back slip pocket, plus a slip pocket inside. It also features an optional recessed zipper closure, and an adjustable cross-body strap. The bag has room for another focus print on the inside flap too! The pattern originally called for snap tabs on the flap and pleated pockets, but I didn't have any snaps that would go nicely with these elegant fabrics, so decided to create a different closure type: with 2 D-rings and a strap. I thought I was being really original, but as it turned out, others had done the same thing. They must have great minds! Since being released apart from the Bag of the Month Club, Anna has updated the pattern to include the D-ring closure and also a thumb-lock option. I used Pellon Flex Foam 77 as my main stabilizer in the bag, plus Pellon Shapeflex 101 throughout and Pellon Craft Fuse 808 for the pleated pockets and back pocket. I was a bit nervous about the pleated pockets, but they were a cinch to do with the pattern instructions. I opted for the recessed zipper to create a more finished and functional bag. I used bulk zipper tape and pulls from Paccana to make my own matching zippers. See my blog post and video here to make your own! The bag is finished with binding along the top to join the the interior and exterior. I think the binding on the pocket tops is nice, but I may sew it without the binding finish next time, and just turn it through a gap next time since binding finishes aren't my strong suit. I do like how it ties in all the accent pieces though. For my final touch, I used metal zipper ends from Emmaline Bags. I think they add the perfect amount of bling, and I love them because they save me from fussy fabric zipper ends. What do you think of the Campfire Messenger? Print out your copy of the PDF and get started on your own! 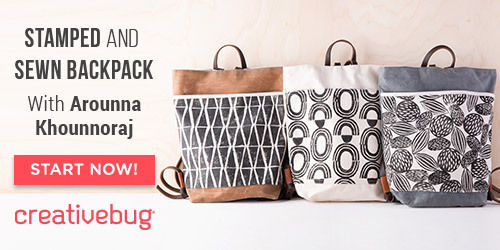 If you weren't part of the Bag of the Month Club, you can now buy this pattern individually from Noodlehead, here. 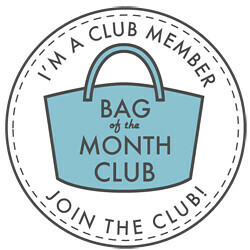 Now that you've had a chance to see some of the bags from this year's Bag of the Month Club, I'm curious if you'll be joining me next year. Answer this quick poll, or leave me a comment. Anna from Noodlehead has generously set up a coupon code for my readers to save 20% off the Super Tote pattern. Use code STSAL, valid until August 31, 2015. Yesterday we completed all the different pieces, and today we'll put them together to assemble and complete the bag. If you've chosen a recessed zipper, you'll need to add it to the lining. We'll do that now. If you've opted not to have a recessed zipper, skip to the gussets. Take your completed recessed zipper panel and place it right side up on Lining B, which should be right side up, matching folded edge of zipper panel to top raw edge of lining B, then place lining A right side down on top, matching raw edges of lining A and B with folded edge of zipper panel sandwiched between lining pieces. Sew together, open and press seam up toward lining A, then topstitch on lining A. Repeat with remaining lining pieces and other half of recessed zipper panel. Place both exterior gusset pieces right sides together. If you have a directional fabric, pay attention to which ends are together. Sew along one short edge, press seam open and topstitch along each seam. Repeat with lining gusset pieces. Next step is marking the pleats on the gussets. Flip over and use the pattern piece to place your marks onto the interfaced sides of the unsewn short edges of the gussets. You will be making marks on each short edge of both the exterior and lining gussets. Once you've placed your marks, fold right sides together, matching the pleat marks and sew along the pleat line, making sure to backstitch several times. Do this for each pleat marking (2 on exterior gusset, and 2 on lining). Press all pleats open (flat). Now we attach the gussets! This is my favourite part!! Start by finding the centers of your assembled exterior bag front, then pin/clip center of gusset right sides together there and then matchup top of bag front with top of gusset and pin/clip there. You want to take your time with this step to make sure it's lined up nicely, use lots of pins or clips. To sew together, start at top of gusset/bag front, then sew down toward the center, then start again at the other side and continue again to the center, completing the line of stitching. Repeat with exterior bag back and other edge of gusset. Then repeat with lining gusset and assembled lining, except leave a 4-5" turning hole on one side or bottom of one lining/gusset, making sure to backstitch at start and stop of hole. The lining will be a bit tricker, because the zipper panel connects the lining pieces. Just make sure you don't sew through the zipper panel. I pinned mine out of the way. Open zipper at least half way. Turn exterior bag right side out. If you're feeling adventurous, press seam allowance toward gusset and topstitch along gusset. This step is optional, but does give an extra nice touch; it's tricky, my tip is to not be afraid to manhandle the bag. Place the exterior bag into the lining, right sides together. Match up all seams and pin or clip along top of the bag (make sure you tuck you handles in, or even pin them safely inside the bag). Sew along top of bag, using the free arm makes this step a lot easier. Now turn bag right sides out and give it a good once over. If you see any spots that need to be sewn, now's your chance to fix it before you close it all up. Press the edges of the turning hole in and stitch using a very small seam allowance or hand stitch the hole closed. Push the lining inside the exterior and finger press, then press along top edge. I like to use clips here too. I find sometimes when I don't clip, this folded edge can roll, and I don't end up with a nice even topstitch. Topstitch along top edge of bag; I usually stitch about 1/8" away from the edge, but this distance comes down to personal preference. Anna suggests in the pattern, and I agree, that a slightly longer stitch length looks really nice for a final topstitch. If you're using metal zipper ends, and you haven't installed them yet, do that now. Now your bag is finished!! Give it a final pressing and go show it off! Don't forget to use #HappyOkapiSTSAL to be entered to win the prize and share your work. Let me know if I can share your pictures too. 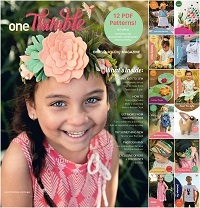 As a recap, here's how you can win 2 Noodlehead patterns of your choice. Welcome back! If you missed Day 1, check it out here. Yesterday we did all the prep work, and today we'll do what I call "the fussy work," leaving the assembly of the bag for tomorrow. A note about this sew-along: the pattern is written wonderfully, so feel free to refer to it as we go along. Let's get sewing! The pattern gives directions to make the strap by turning a tube and topstitching, but I prefer a method I learned in a different Noodlehead pattern. I'm going to use the size of the straps already stated in the pattern, but feel free to alter your strap size. I use 2 different fabrics for each strap. I start by placing one set of straps right sides together and sewing along the long edge. Then press seam to one side, and fold and press each long raw edge into center crease, then bring folded edges together. Topstitch along long edge where folds meet, then topstitch along other long edge. Repeat with remaining set of straps. Set aside. As mentioned in Day 1, I like my pockets to be fully lined. I'll start by inserting a magnetic snap into the lining of my pocket. I folded my pocket in half to find the center, then marked a dot 2" from the top raw edge of the pocket lining to mark my snap. I like to use my seam ripper to cut the slots for my magnetic snap; just go slowly when you're cutting, making sure the hole isn't too big. I also used a scrap of stabilizer on the wrong side of my pocket lining to help secure my snap and make sure it doesn't rip through the fabric when being used. I added the male half to the pocket and will add the female half to the front of the bag later. If you want to add piping to the pocket, add it now, by matching the raw edges of the piping to the top raw edge on the right side of the pocket front. If you've never tried piping before, this is a great time to give it a go! It's just one straight line, so as far as piping goes, it doesn't get any easier than this. Place the pocket front and lining pieces right sides together and sew along the top (as close to the piping as you can if you added it). Turn right sides out, press and topstitch. Set aside. Since my interior pockets are fully lined, I start by sewing both pieces right sides together, turning, pressing and topstitching. Then I add another row of stitching 1/2" away from the previous toptstitch, to create a casing for my elastic. Feed the elastic through, secure with zigzag stitch on both ends. Baste bottom of pocket pieces together and gather until the pocket is the same width as the lining pattern piece B. Baste pocket to lining along side and bottom. Sew vertical line in center of pocket as divider. Repeat with remaining pocket pieces and elastic. This part is optional, but I highly recommend it. I think zippers give bags a much more finished look. Take your recessed zipper panel and fold in all edges 1/4", wrong sides facing. I use my metal gauge for this step - just make sure you don't touch it, because the iron heats it up pretty quickly! Once all your sides are folded in, fold the piece in half lengthwise (like a hotdog) and press again. Now open up one crease on a long edge and match the raw edge to one long edge of the underside of your zipper tape, pin or clip, then sew along crease. Now flip zipper over and fold panel back, then topstitch along short sides and long side closest to zipper, leaving folded edge unstitched. Repeat with remaining panel and other side of zipper. I will be adding metal zipper tabs to my bag as the final step, but if you're using fabric tabs, add them now as directed in pattern. Place straps on Exterior B centered and 4.5" apart, then pin in place. Then place Exterior A right sides together on Exterior B, matching long raw edge of A with top raw edge of B. Sew in place, securing straps as well. Lift Exterior A, press seam allowance down and top stitch along top of Exterior B. See diagram in pattern for stitching placement to further secure straps. Repeat above for remaining Exterior A, B and strap. Baste assembled pocket onto front Exterior A/B assembly along sides and bottom (curve) of pocket. At this point, you can find the perfect placement for the other half the magnetic snap, and install it, again using a piece of scrap stabilizer on the wrong side of the bag front. That's plenty for today. Come back tomorrow when we'll complete the bag! I'm so glad you've decided to join me in making a Noodlehead Super Tote! If you don't have the pattern yet, you can use discount code STSAL to save 20% from Noodlehead (discount good until August 31 2015). If you prefer paper patterns, you can also purchase one at Fabric Spark. If you still need some fabric inspiration, or planning your next one, you can use code HAPPY15 to get 15% off all Linen and Canvas fabrics at Fabric Spark (code valid until July 31, 2015). Let's get started! If you've purchased the PDF, print it out, cut the pieces and tape together where indicated. Before we get to cutting fabric, we need to plan out the bag. I like to go through my pieces to write out a list of what I need to cut and then decide which fabrics I'll use for them, or you can just follow the pattern's suggestions (each piece specifies what to cut). Don't mind my messy hand writing! I also like my bags a bit firmer, so I'm not following the interfacing suggestions exactly. For my last Super Tote, I used quilting cottons, so I used Pellon Craft Fuse 808 and Fusible Fleece on my lining pieces and Pellon Shape Flex 101 on my exterior. This time around, my bag is mainly canvas, as the pattern calls for, so I decided on Craft Fuse for the lining and Shape Flex for the exterior. Extra: I like all my pockets to be fully lined, so I cut a second front pocket, and 2 extra interior pockets in a coordinating solid. This sew-along will have instructions to make the bag with these pocket linings. Once you've decided which fabrics are going where, it's time to start cutting! Tip: I find it faster to cut my interfacing first, then fuse it to my fabric and then cut out the fabric. I've also heard of others fusing large pieces of interfacing to fabric, and then they only need to trace and cut once - if you got your interfacing on sale, that might be a really good option. I also clip my pattern piece to my cut out pieces as I go, so I don't lose track of what my pieces are. Sometimes I just write on the interfacing with a Frixion marker. I cross the pieces off my list once I've cut them; it helps me keep track and makes me feel better about the least favourite part of bag making (cutting and fusing). Once you've cut and fused everything, place it in a nice pretty pile, and we'll see you back here tomorrow to start sewing. I had an opportunity to test another pattern for Sara at Sew Sweetness, and this time, it's not a bag! It's called the Creative Maker Supply Case, and, as the name implies, it's a case to hold supplies. The pattern comes in 3 sizes. This one is the large and it's about the size of a binder, large enough to hold a full sized notebook. I'm also working on a couple small cases, and they're great for crayons and a small colouring pad, plus a few craft supplies. The pattern comes with directions for elastic slots on one half, to hold markers or pencils. The other half has a mesh pocket and a fabric pocket. The whole thing zips up to keep all your contents safe inside. You can really do whatever you want inside though, which is what makes this such a great pattern. If you want one side to be half pens and half thicker markers, then you can adjust the elastic slots. Or maybe you want pockets on both sides. The possibilities are endless really. I made the zipper with double pulls following the method I explained in my zipper post, here. I followed the interfacing suggestions in the pattern and used all Pellon interfacing. It's a nice and quick project. I found the elastics a bit tedious, but certainly not difficult. I'll admit the zipper was a bit tricky at the spine of the case, and for that reason, I'd consider this to be an intermediate sewing level project. Don't let that scare you though! It's definitely worth it! I see so many uses for this pattern: kids colouring case for trips, sewing project case, teacher's supplies, you name it! I saw someone suggest it would be good for diabetic supplies or other medical equipment, and I think that's certainly a possibility with some easy personalization inside the case. The pattern is now available from Sew Sweetness, you can find it here. I'd love to hear what you think. What will you do with yours? Let me know in the comments. I'm so excited to announce my next Sew-along! This time, I hope you'll join me in making a Noodlhead Super Tote. If you're not familiar with the Super Tote, you're in for a treat! This is a gusseted tote with a roomy exterior pocket and a recessed zippered closure. Inside are large slip pockets. This tote is so great for a day of errands, a walk around town, or a carryall for busy moms. Mark your calendars: We'll start on July 17, for a weekend of sewing. Similar to my last SAL, I have some discounts to share with you, and a prize! I will randomly select a participant who completes their Super Tote to win any 2 Noodlehead PDF patterns. Entries must be in by August 5. 2015. See below for details. I will be using Anna's Rain Walk collection from Cloud 9 for my Super Tote. I can't wait to dig into this gorgeous fabric! What do you now? If you don't have the pattern, you can purchase the PDF here (don't forget to use code STSAL to save 15%) or the paper pattern from Fabric Spark here. Next, you'll need to select your fabrics. Refer to the pattern for requirements. Note: depending on the fabric types you choose and your personal preferences, you may wish to add fusible fleece and Pellon Craft Fuse to your interfacing. Check my Canadian Sewing Links tab for great sources in Canada. I really love following everyone's progress so please use #HappyOkapiSTSAL on Facebook and Instagram when you post about it so we can all see what you're up to. I'll see you back here on July 17th! There is no official signup, but I'd love to hear from you if you plan on joining. Leave me a comment letting me know. NCW SAL wrap-up and winner! I had so much fun watching everyone's NCW progress on Facebook and Instagram! Thank you to everyone who joined in. I really loved seeing all the variations: some people added straps, piping, back pockets, etc. It lends to the pattern how great it is that it can be adapted so easily to suit everyone's needs. Here's mine. I used Sweet as Honey by Bonnie Christine for Art Gallery, and the turn lock from Emmaline Bags. I used Lisa's interfacing suggestions with Pellon Shapeflex 101, Craft Fuse 808, and Peltex 70. I really love the firmness, and all the pockets: there's a spot for everything! Michelle from Barabooboo Designs has done it again! She never ceases to amaze me with her gorgeous work. A wonderful fussy cut flap, and I love the triple top-stitch instead of the additional border piece. What a nice touch! Cathy at Creations By Cathy makes such lovely NCWs and I've recommended her work to others when they're looking for one. She added a tab between the divider and pocket, and an extra back pocket too. Another beautiful job Cathy! This is Evette's first Necessary Clutch Wallet and I'm blown away! Look at the matching on the flap! Amazing! Nanette sent in these pictures of one she made for her daughter who raises chickens. How perfect is that?! I love the addition of piping. Jessica at Jess Lynn Designs also made one and I love it! The vibrant colour combo is so refreshing! Fiona from Tangled Blossoms Design made six!!! Here are a couple of her beauties. She used a combination of Jennifer Paganelli and cork. They're all stunning. I'm so glad this was a random contest, because it would have been too hard to pick "the best" one. They are all so great! With the help of Random.org, I came up with Kimberly T. as the winner of the credit at Emmaline Bags. Congratulations Kimberly, and thank you everyone for sewing with us! I'd also like to extend a special thank you to Janelle at Emmaline Bags for offering the pattern discount and prize. If you'd like to see more finished NCWs and some progress pictures, check out #HappyOkapiNCWSAL on Facebook and Instagram. Missed the discount and prize, but still want to follow along? Find Day 1 here. I'll be announcing another Sew-Along this week, so clear your cutting table and get ready to join me again.